Join us for a few cold ones this Sunday as we feature some of the latest craft beers to hit Singapore’s shores from Rye & Pint Brewing Co., Brewlander & Co., BottlesXO and Archipelago Brewery. Non-beer drinkers can enjoy a cold Albans Cider, cocktail or mocktail from the Kult Kafe bar. Live music by Marcel Lee Pereira and Ronald Goh. F&B by kult kafé, Sidecar Sausages and Banyan Tamarind Foods. Great deals on craft beers all day – $12 each / $50 for 5! Basketball, pool table, and garden games to keep you entertained all day. Free entry and kid and dog friendly! No outside food and drinks please – your custom helps us keep the party rolling. Beat the queue with WAAVE cashless-payment system! 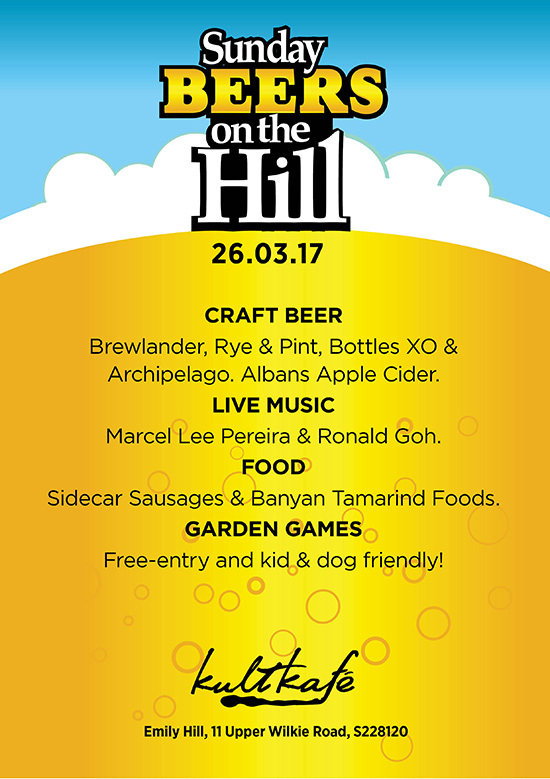 Sunday Beers on the Hill is organised in partnership with Singapore Craft Beer Week. Kult Kafé on Emily Hill is only a 6-8 min walk from Wilkie Edge or Little India MRT.